The term “sanctuary” has been used as both a shield and a sword all across the political spectrum of the immigration debate. But author and organizer Mar Velez writes that Oakland youth have used the sanctuary framework before in a different context – to beat back gang injunctions. She shares how those lessons can inform today’s battles. Editor’s Note: The term “sanctuary” has been used as both a shield and a sword all across the political spectrum of the immigration debate. But author and organizer Mar Velez writes that Oakland youth have used the sanctuary framework before in a different context -- to beat back gang injunctions. She shares how those lessons can inform today’s battles. Sanctuary schools, sanctuary cities, sanctuary counties, sanctuary states. What does it really mean to be a sanctuary? From politicians to grassroots activists to Trump supporters, today sanctuary is a buzz word in everyone’s mouth. It is a rallying cry for the protection of vulnerable groups that often boils down to the protection from deportation and discrimination of non-citizens. Any city or state using the term is also choosing to be targeted by the Trump administration. Trump threatened to withhold federal funding from cities choosing to take active measures to protect vulnerable populations. Fortunately, this tyrannical threat of injustice has been checked. A lawsuit filed by Santa Clara and San Francisco counties declared this potential policy as unconstitutional. Clearly sanctuary means embracing the changing tide of America – a threat to white supremacy. The concept of a sanctuary city, however, is not new. Oakland identified as a sanctuary city long before agent orange took office – and it was Oakland youth that were defining how a sanctuary city should protect its people. Back in 2011, the City of Oakland instituted the gang injunctions as a crime control mechanism specifically targeting neighborhoods of North Oakland and Fruitvale. Under the guise of public safety the gang injunctions came down heavily on youth of color and their families. Once targeted, youth were filed in a local gang database of Oakland’s “most dangerous” gang members. Youth, families, and local community activists immediately organized. The community-led organizing efforts found that crime had actually risen in the targeted neighborhoods during the less than one year of the gang injunction being instituted. More importantly, people were wrongfully accused of being involved in a-gangs. The arrests under the gang injunction were based on unfounded profiling or associations with family or friends. Many of those wrongfully accused were young men of color. The consequences of being placed on the gang injunction data base meant tireless harassment from the Oakland police and non-stop surveillance. The doors of these young men’s homes were getting kicked in as they were pulled out of their beds in the middle of the night for even a suspicion of violating the injunction. These young men had to deal with the collateral consequences of being targeted. The gang injunctions exposed other vulnerabilities of the young men such as documentation status, pervasive poverty that was aggravated by administrative fees for arrests and lawyers, and strained the mental and emotional health of their families and themselves. It was evident that one of the goals of these injunctions was to destabilize homes to clear the geography of black and brown bodies. In other words, gentrification. Classic police state mechanisms working to gain profit. 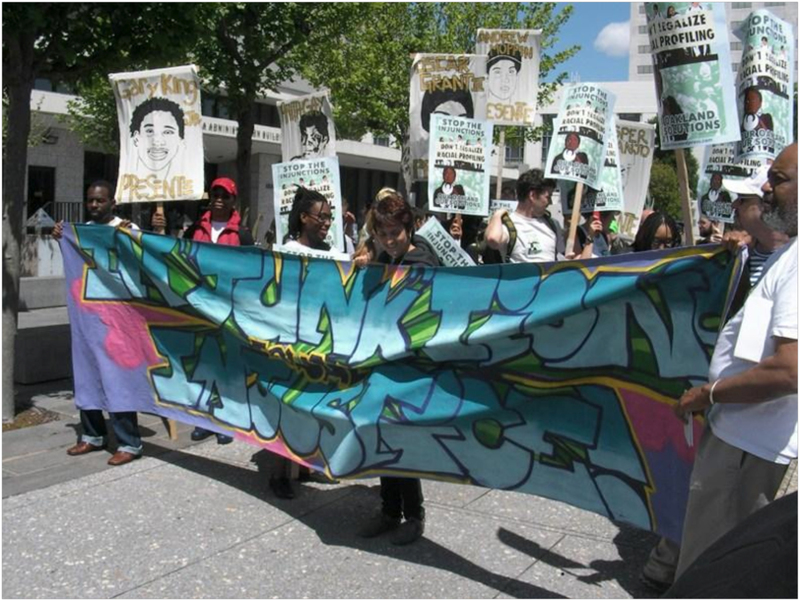 As the youth organized they connected the dots between criminalization, immigration and the school to prison pipeline. They knew that once a young person was targeted as being part of a gang, a slue of consequences would come down such as deportation of the young person themselves and/or of their families. Walkouts were organized, teach ins were happening, all of Oakland became aware of the youth resistance and cry for a city that would protect its youth of color instead of criminalizing them and sending them down a pipeline of imposed criminality and poverty. The organizing around the gang injunctions led to a lawsuit where people who were listed on the gang database came together to sue the City of Oakland. The political and economic strategy was ingenious. The City found that it would be too economically burdensome to sustain the gang injunctions based on the finding that the injunctions indeed profiled and wrongfully accused individuals of belonging to gangs. Altogether, the City of Oakland got rid of the injunctions and the database. One of the greatest lessons learned from the fight against the gang injunctions is the ability for youth to see the way one struggle is an organizing opportunity to fight against many other oppressions simultaneously. This does not mean that one issue, in this case criminalization, was more important than another issue, for example, documentation status. It meant that the organizers were able to pinpoint how making a community vulnerable to one issue actually opens up the community to be vulnerable in many other aspects. 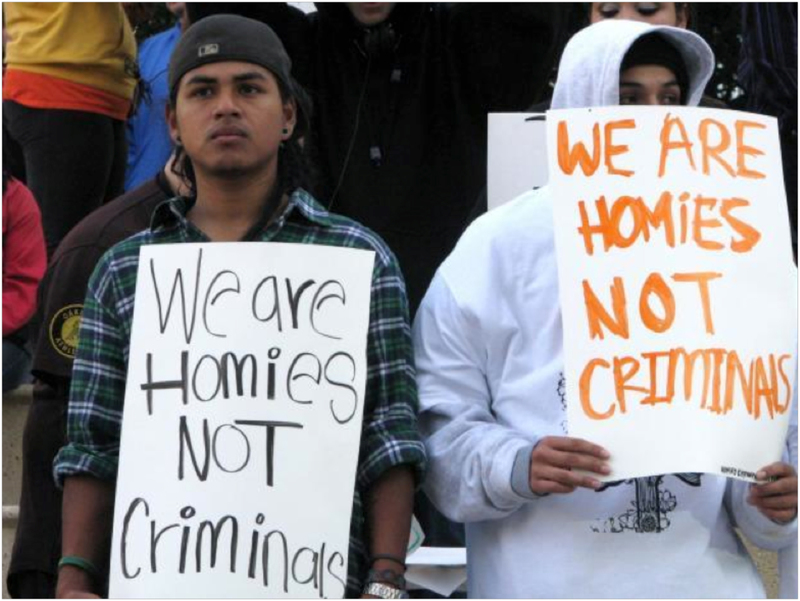 Communities were suffering from criminalization but also from securing affordable housing, experiencing displacement, and environmental and population health issues. Youth and community saw this fight as a united fight to gain leverage around many other issues, all while staying focused on the target: defeating the gang injunctions. We can learn from this today as we are up against an administration that is trying to set communities against one another by using divisive and scare tactics. We must not be distracted. We must understand that our freedom lies in our ability to unite. Not much about today’s political landscape is different. We are dealing the same system that we were dealing with before. The system that dehumanizes people of color, trans and queer people, and women and youth. Now, however, the individuals that are supportive and benefit from this system have political power to be unapologetic about their bigotry and to systematize these values in the laws and policies of this country. We have to lead with our values and beliefs more strongly than ever. One of these values, in the words of Assata Shakur, is that we must love each other and protect each other. Federal Judge Rules Against Trump's Executive Order to Defund "Sanctuary Cities"
Mar Velez is Organizing and Policy Campaign Manager at Communities United for Restorative Youth Justice. She works to elevate voices of youth to create systemic and transformational change in Oakland and across California.